SANTO DOMINGO, Dominican Republic (CNS) — Guatemalan Catholic bishops called for an overhaul to the country’s electoral law and for political parties to wipe out corruption amid a widening crisis that has left President Otto Perez Molina fending off calls for his resignation. In a June 3 letter, the bishops’ conference said it supported protesters who have held demonstrations across the country during the past month, demanding Perez, a former military general elected in 2011, step down. “We need to break the cycle of corruption, impunity and conflict to be a different Guatemala,” said the letter, signed by Bishop Rodolfo Valenzuela Nunez of Vera Paz, conference president, and Bishop Domingo Buezo Leiva of Izabal, conference general secretary. Perez has vowed to finish his term, which expires in January, while rejecting suggestions that his government is collapsing. 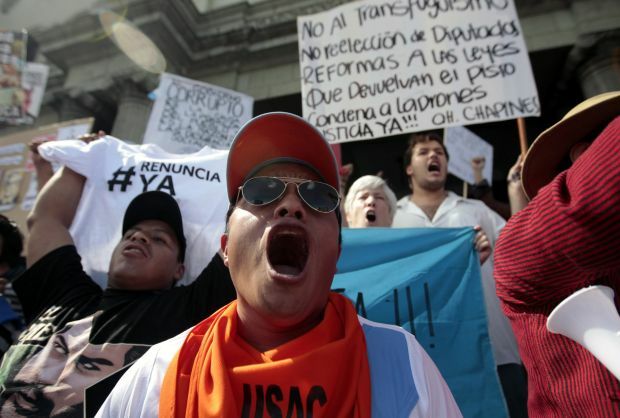 Protests have been growing since early May when then-Vice President Roxana Baldetti resigned as prosecutors investigated whether importers allegedly bribed officials for reduced duties on shipments. Baldetti has not been charged, but prosecutors said her top aide, Juan Carlos Monzon, was behind the conspiracy. Then, in late May, 15 officials were arrested for their alleged connection to a scheme in which the Social Security Institute rigged contracts for a Mexican pharmaceutical company in exchange for millions of dollars in kickbacks. The twin scandals have forced the resignations or firing of dozens of government officials, including the head of the central bank and top ministers. “Against this background we want to scream with indignation: Enough!” the bishops wrote in the letter. The letter called for Congress to act swiftly to approve changes to the election law, which would establish term limits for lawmakers and mayors and would apply greater oversight of contributions to political parties and the way the funds are used. Voters are scheduled to go the polls Sept. 6 to elect a president, members of congress and mayors and local council members. “The electoral process is important but it is also clear that the inability — due to malice and ineptitude — of Congress to change the electoral and political party laws means citizens are facing an election in which there will be more of the same,” they wrote in the letter, published on the conference website. The bishops said citizens should continue to pressure Congress to adopt the reforms. Tens of thousands of protesters demonstrated May 30, calling for Perez to resign and for the government to clean up corruption. In Transparency International’s 2014 Corruption Perceptions Index, the Central American country of nearly 16 million ranked 115th out of 175 countries — with 175 being most corrupt — behind neighbors Mexico and El Salvador. Guatemala suffers from high crime, continued migration to the United States and widespread social exclusion, with more than half of its residents living below the World Bank’s poverty line, the bishops said. “Violence is expressed in all sectors of the country, and organized crime is most likely the largest employer in the country,” the letter said.